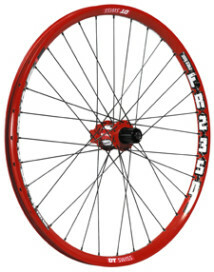 The FR2350 is DT’s new heavy-duty Freeride wheelset which is one hundred percent Swiss made. The FR2350 comes in three different built-in widths between 110 and 150 millimetres. The solidity of the rim has been improved through DT’s ‘Strength Boost Welding Technology” a technique which DT has used before for the production of its rims. The red styling gives the wheelsets a striking look. The FR2350 comes with hubs with stainless cartridge bearings and star ratchet drive system. For road use, DT has developed the RR 1450 specified as a classic lightweight set of 670 grams front and 810 grams rear. The styling of the set is silver gray with fashionable black/white decals. The front wheel has a 28 radial lacing while the rear has a two-cross lacing. The RR1450-rear comes in a Campagnolo and a Shimano version.